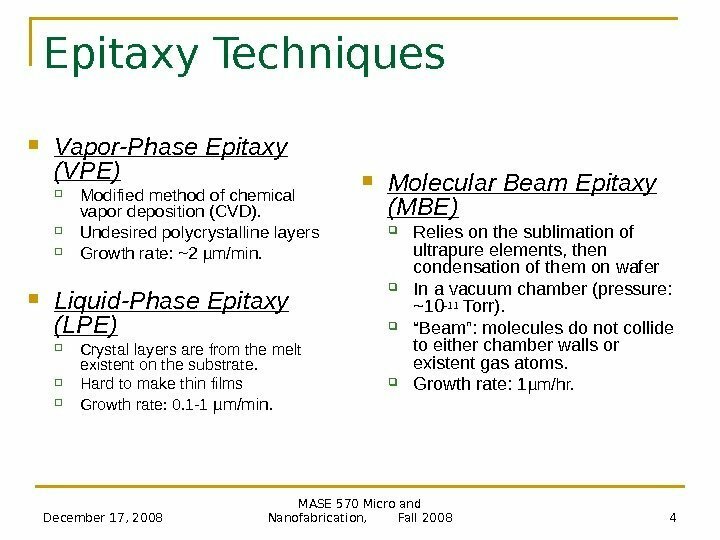 December 17, 2008 MASE 570 Micro and Nanofabrication, Fall 2008 4 Epitaxy Techniques Vapor-Phase Epitaxy (VPE) Modified method of chemical vapor deposition (CVD). 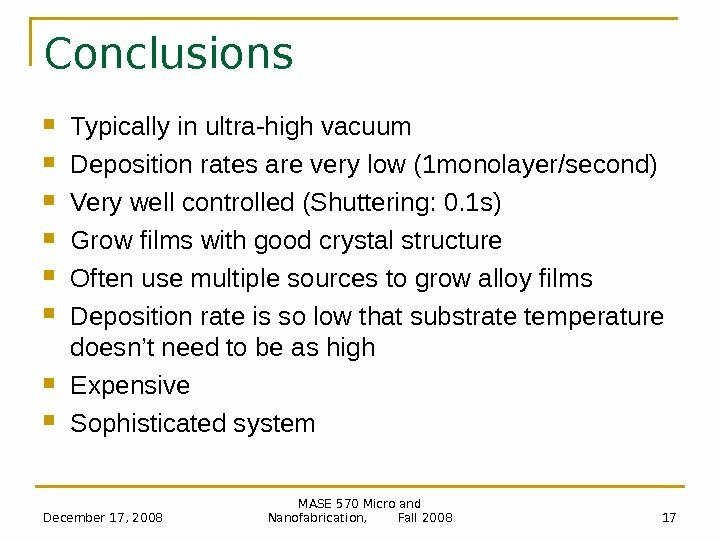 Undesired polycrystalline layers Growth rate: ~2 µ m/min. 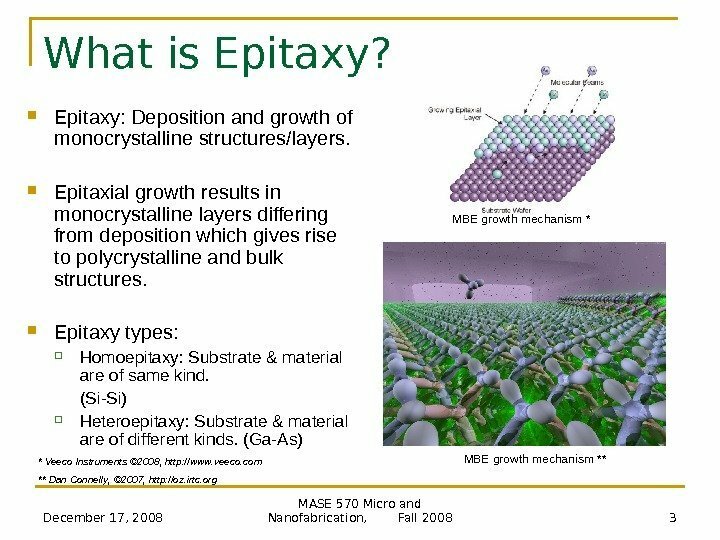 Liquid-Phase Epitaxy (LPE) Crystal layers are from the melt existent on the substrate. 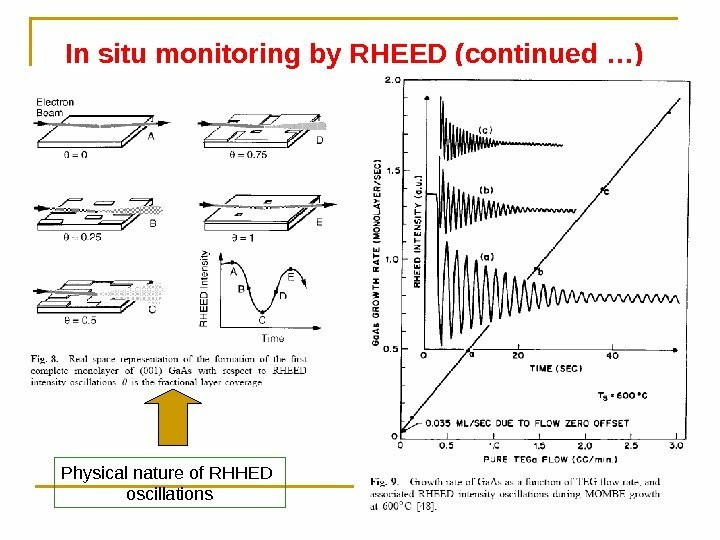 Hard to make thin films Growth rate: 0. 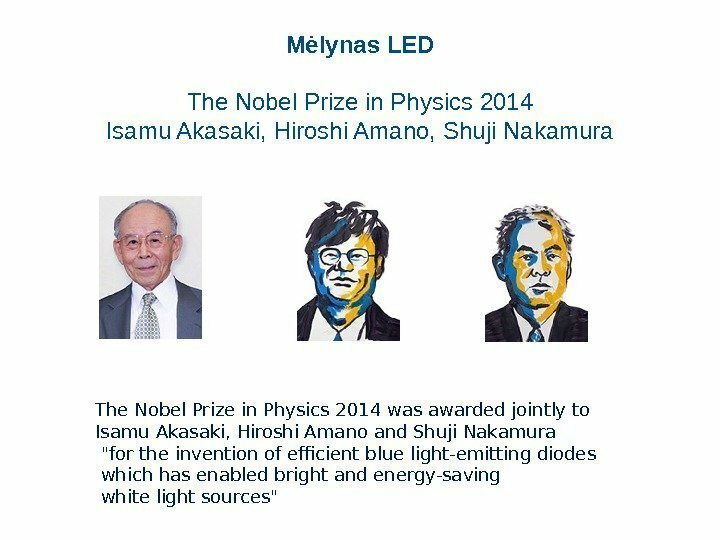 1 -1 µ m/min. 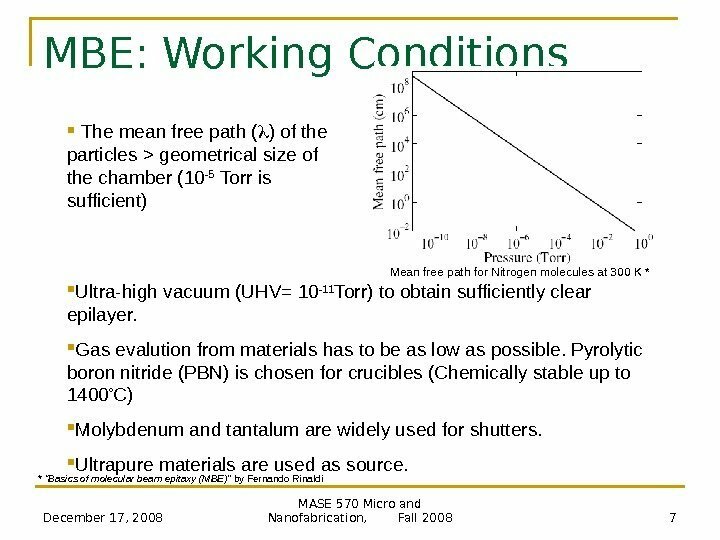 Molecular Beam Epitaxy (MBE) Relies on the sublimation of ultrapure elements, then condensation of them on wafer In a vacuum chamber (pressure: ~10 -11 Torr). 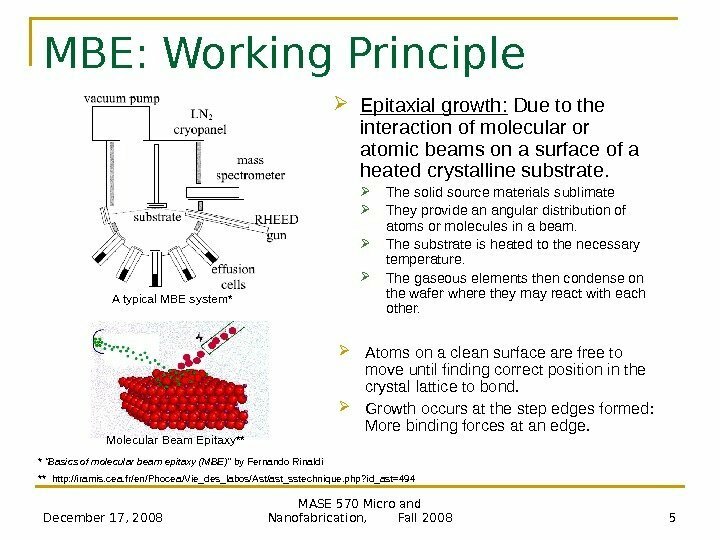 “ Beam”: molecules do not collide to either chamber walls or existent gas atoms. Growth rate: 1 µ m/hr. 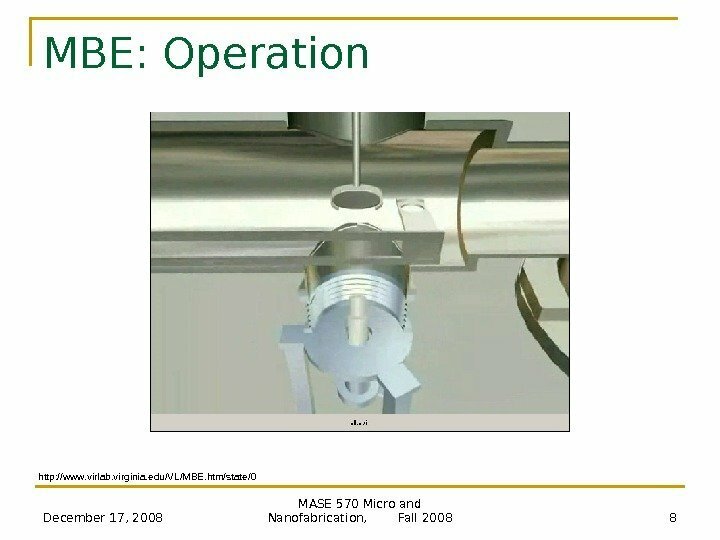 December 17, 2008 MASE 570 Micro and Nanofabrication, Fall 2008 5 MBE: Working Principle A typical MBE system* * “Basics of molecular beam epitaxy (MBE)” by Fernando Rinaldi Epitaxial growth: Due to the interaction of molecular or atomic beams on a surface of a heated crystalline substrate. 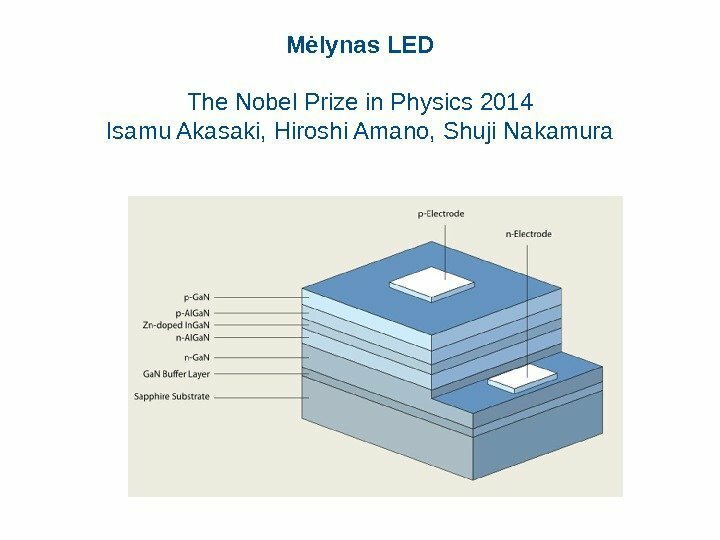 The solid source materials sublimate They provide an angular distribution of atoms or molecules in a beam. 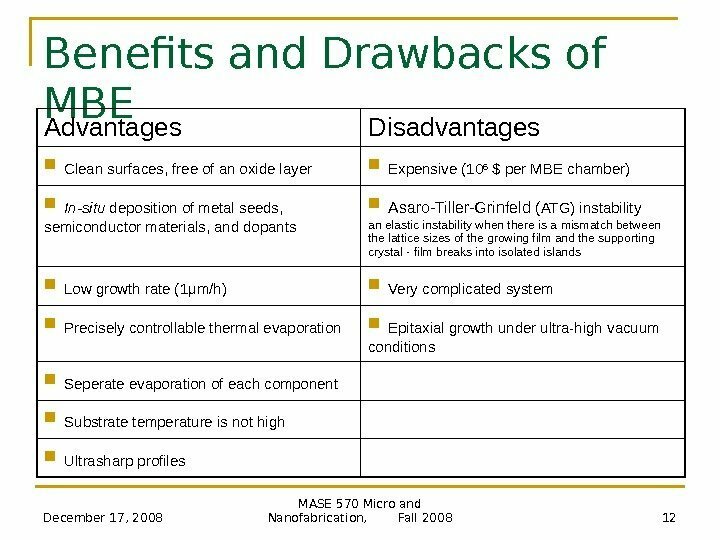 The substrate is heated to the necessary temperature. 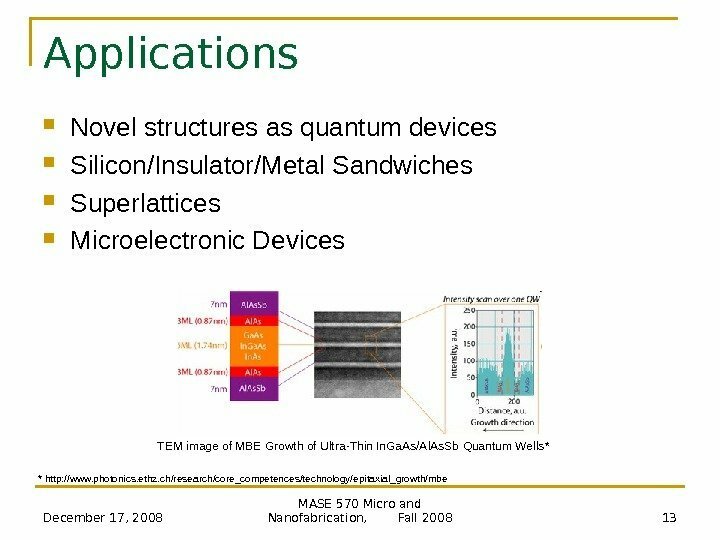 The gaseous elements then condense on the wafer where they may react with each other. 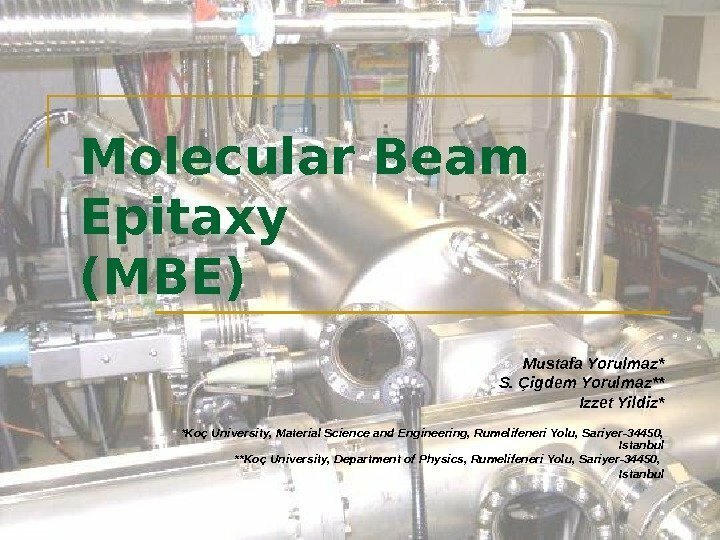 Molecular Beam Epitaxy** ** http: //iramis. 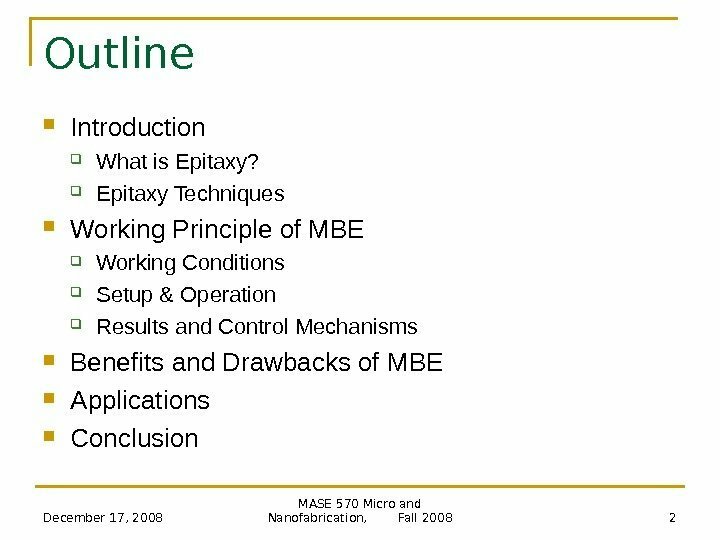 cea. fr/en/Phocea/Vie_des_labos/Ast/ast_sstechnique. php? 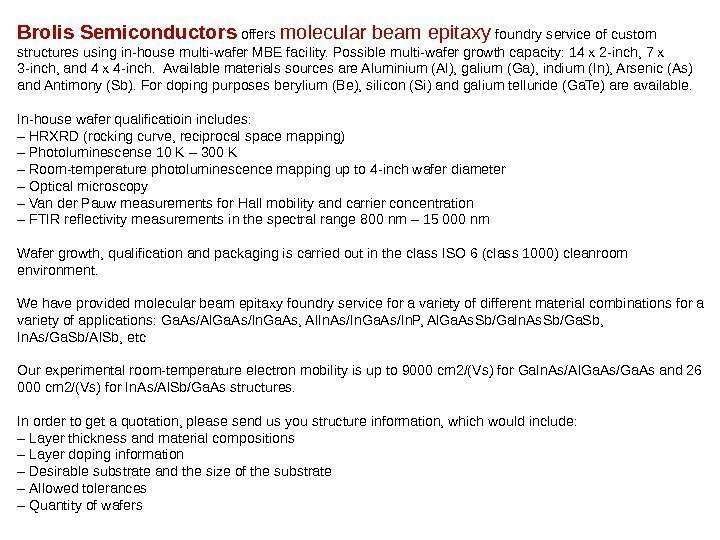 id_ast=494 A toms on a clean surface are free to move until finding correct position in the crystal lattice to bond. Growth occurs at the step edges formed : M ore binding forces at an edge. 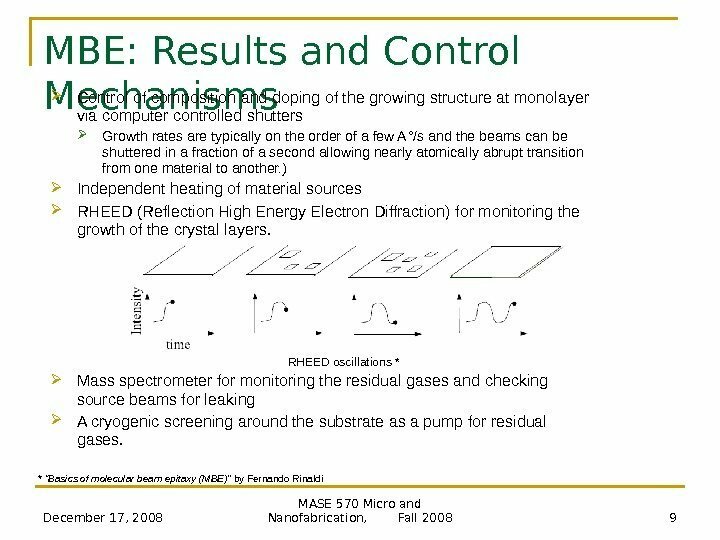 December 17, 2008 MASE 570 Micro and Nanofabrication, Fall 2008 9 MBE: Results and Control Mechanisms RHEED oscillations * * “Basics of molecular beam epitaxy (MBE)” by Fernando Rinaldi Control of composition and doping of the growing structure at monolayer via computer controlled shutters Growth rates are typically on the order of a few A ° /s and the beams can be shuttered in a fraction of a second allowing nearly atomically abrupt transition from one material to another. ) 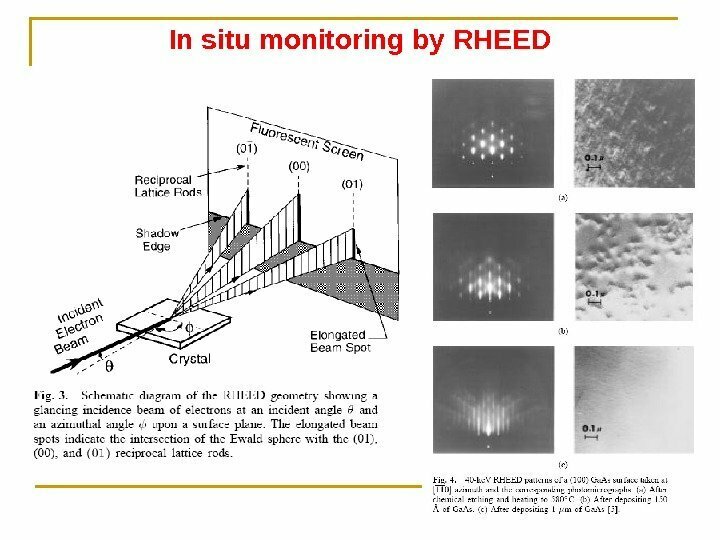 Independent heating of material sources RHEED (Reflection High Energy Electron Diffraction) for monitoring the growth of the crystal layers. 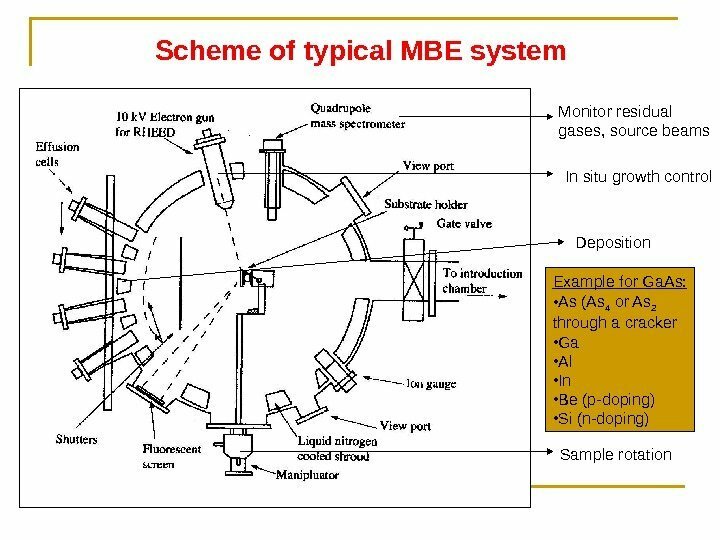 Mass spectrometer for monitoring the residual gases and checking source beams for leaking A cryogenic screening around the substrate as a pump for residual gases.